Whisk sour cream, vinegar, paprika and salt in a large bowl. 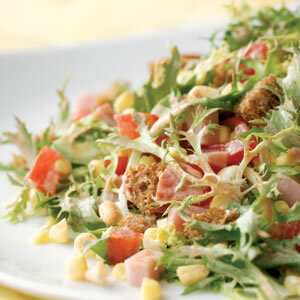 Add frisée (or salad greens), tomato, corn, croutons and ham; toss to coat. Shopping Tip: Smoked paprika is a spice made from ground smoke-dried red peppers. It’s available in some large supermarkets with other spices and at tienda.com. Tip: To remove corn from the cob, stand an uncooked ear of corn on its stem end in a shallow bowl and slice the kernels off with a sharp, thin-bladed knife.